TSKHINVAL, March 22. /TASS/. South Ossetia has reacted to Georgia’s military drills with NATO, warning Tbilisi that in case of a military provocation it would request Russia’s assistance, head of the republic’s delegation Egor Kochieyev told reporters after the Incident Prevention and Response Mechanism meeting on Friday on South Ossetia’s border with Georgia. 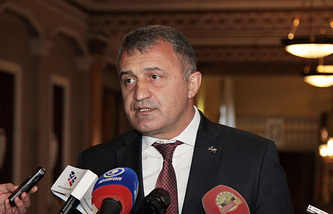 At the previous meeting Georgia misinformed South Ossetia about its drills with NATO, noting that this exercise did not involve conducting any combat actions. "However, we learnt, including from mass media, that these drills would practice an offensive operaton," Kochieyev said. "We voiced our concerns about this stating that in case of any provocations by Georgia South Ossetia would turn to its powerful ally Russia for assistance and together we will be able to defend our gains, which we have," Kochiyev said. Georgia holds joint drills with NATO, called NATO-GEO Exercise 2019, on March 18-29. NATO Secretary-General Jens Stoltenberg and members of the alliance’s Military Committee are expected to arrive in Tbilisi. The Incident Prevention and Response Mechanism (IPRM) meetings have been held on a regular basis since 2009. They are traditionally attended by representatives of South Ossetia, Russia and Georgia, with the mediation of the Organization for Security and Cooperation in Europe and the European Union. The previous meeting was held in December 2018. The next meeting is expected to take place on May 16.